Hi! If you are new here, you might want to subscribe to my RSS feed for updates from me. Wow! It’s part seven of my Summer Sides and Dips series. We have just one more entry to this series next week. In this installment we have 8 Delicious Dips for summer entertaining. 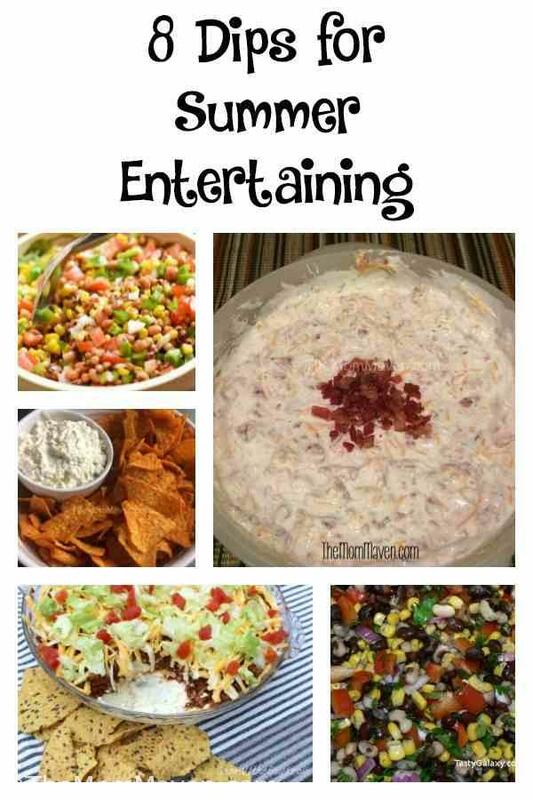 I love a good dip, they are flavorful and easy to bring to a pool party or picnic. The list of potential dippers is huge and includes celery, crackers, pita, tortilla chips, peppers, carrots, and cauliflower. Today’s dips were sent in from some of my favorite recipe bloggers and I hope you find a few to add to your dip arsenal. The Cowboy Caviar recipe from Tasty Galaxy can be served as a dip or a salad. I make this Bacon Cheddar Dip year round. It is best when it has been refrigerated overnight so fix it a day before the party. Mom vs The Boys shares her Beefy Taco Dip recipe which I think could make a good entrée as well. I had forgotten about this Southwest Dip, I need to whip this up this weekend! I’m not a fan of beans because of my texture issues. I think I’d like this smooth White Bean Dip with Seasoned Pita Chips from Nest Full of New. My Doritios Dip is a hit every time I make it. Who knew Doritos could taste even better with the right dip? The Texas Caviar Dip from Onion Rings and Things isn’t just a dip, it is great as a meatless taco filling, in an omelet, and on top of a baked potato! Attainable Sustainable shared her Spicy Black Bean Dip, which she says is a flavorful and festive appetizer. I hope you enjoy all of the easy recipes I share here on The Mom Maven. I hope you share them on your social networks. I just ask that you not copy and share the entire recipe with photos. Please use the sharing buttons below and share the link to this post. Thanks!